« Holocaust Remembrance and Liberation, Seventy Years. Teaching history really does matter. 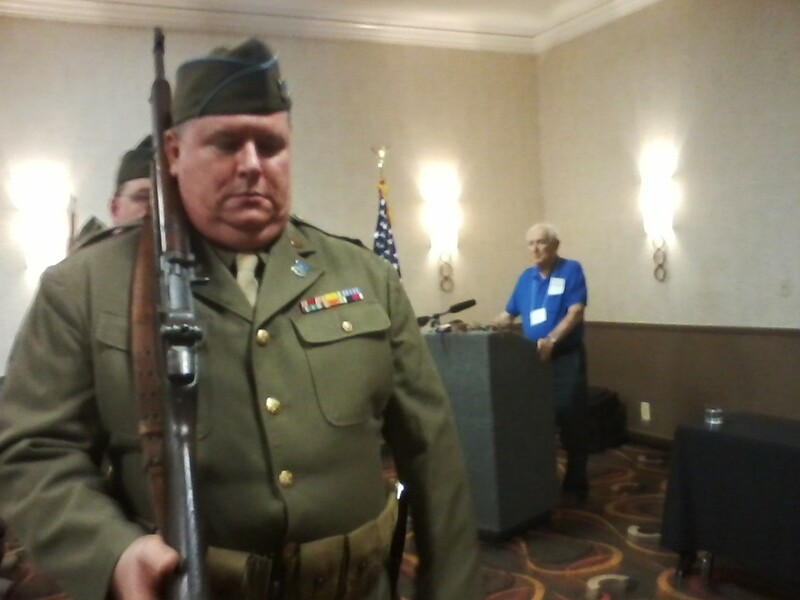 Update from Nashville: At the 30th Infantry Veterans of WW2 70th anniversary reunion. Today’s events began with the posting of the colors and a moving memorial service for the veterans of the 30th Infantry Division and 743rd Tank Battalion who have moved on. Missing many, especially for me Buster Simmons, who would offer up a prayer at this gathering in his capacity as chaplain. Rest on,old soldier. 94 year old veteran Marion Sanford comes up to me and grips my hand. I have not seen him in 2 years, but he is the same to me as he always was. As a reconnaissance man for the 30th Infantry Division, he tells me how much he saw and how much now in retrospect meeting the survivors and their families has meant to him. He saw many terrible things overseas, which he felt he had to leave out of his 2012 book, ‘Old Hickory Recon’. Don’t think for a minute that a soldier understood why a friend might be killed and the fickle hand of fate spared another. In what way can this be justified? Survivors’ guilt was not just for the Holocaust survivors to experience. But this ‘small’ incident, the liberation of the train near Magdeburg, seems to have altered his perspective and the perspective of many of the soldiers I have met at these reunions. It seems to have enhanced and added to ‘man’s search for meaning’, in a sense, as far as the soldiers go. Posting the colors. MC Frank Towers in the background. Frank will be 98 in June. After lunch, moving talks today by survivors George Somjen (Hungary), Elisabeth Seaman (Netherlands), Micha Tomkeiwitz (Poland) . To their liberators they recounted the events that they remembered and more importantly, the impact that the liberation and the meeting of their liberators meant not only for them and their families, but also the world. Later, the amazing reflections of the 2nd generation ‘Train near Magdeburg’ survivors who are with us for the first time: Evelyn Marcus, formerly of the Netherlands, Orly Beigel of Mexico, and Marc Boyman of Canada. April 13th, the liberation date, for their families was a date always remembered and celebrated; a time to remember how the American soldiers loved life, and loved people, and treated the survivors with such tenderness, empathy, and respect, in marked contrast to the soldiers from another Allied nation who moved in to replace the Americans as the terms of the peace settlement were adjusted. 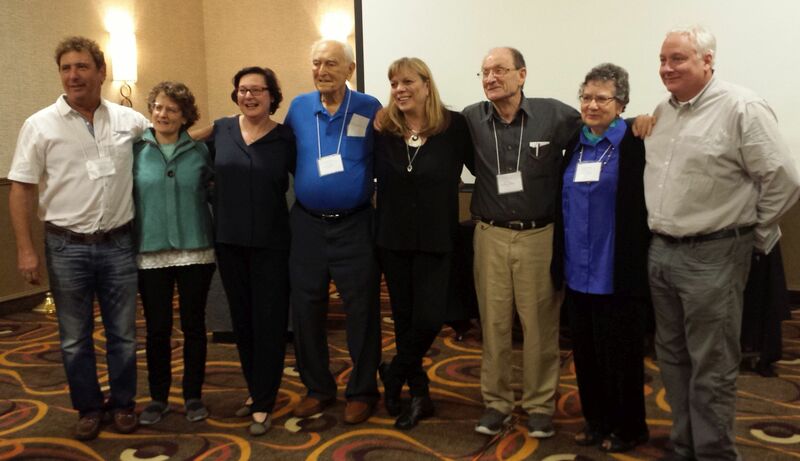 L-R: Marc Boyman, 2nd G; Peggy Wonder, 2nd G; Evelyn Markus, 2nd G; Frank Towers, liberator; Orly Beigel, 2nd G; Micha Tomkeiwicz, Elisabeth Seaman, Matthew Rozell Missing: George Somjen. Photo credit: Patti Jordan. 4-17-15. I heard today so many vignettes of hope and promise for the future of mankind. And this, I witnessed with my own eyes. This gathering, this whole trip is an affirmation of the goodness of mankind, a meditation on the profound difference that one’s actions can make, and the confirmation that teaching history really does matter. Orly Beigel’s mother, far left, 1945. 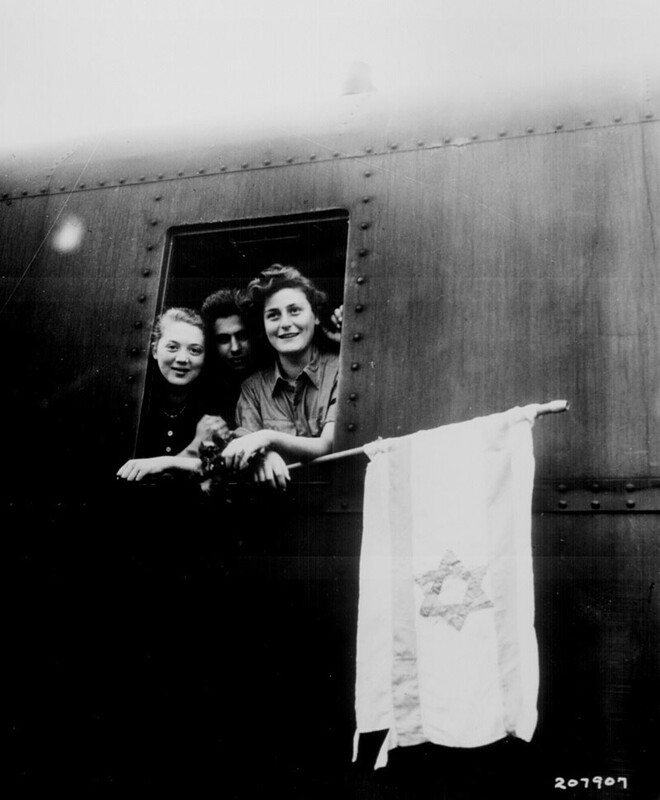 Commonly mislabeled as ‘Buchenwald Survivors Entering Israel, 1945’. No. These girls ( L-Jetty (Jetta) Halpern and R-Magda Werber, together with Jetty’s older sister Golda Katz-Halpern, not pictured) pulled into the station at Guard d’Lion, Paris in France with much fanfare several weeks after liberation; there was a celebration as they arrived, so they thought that a celebrity must be on board. The war was over. In a rare instance, the survivors were the ones being celebrated.